A Tunisian MP from a left-wing opposition party Tuesday tore an Israeli flag in the Parliament premises to protest the normalization of ties with Israel. 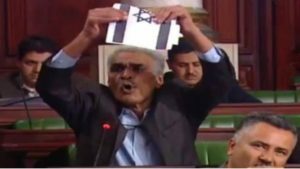 Ammar Amroussia ripped up the flag after the parliament indefinitely delayed the debate of a draft bill criminalizing ties with Israel. The bill, reports say, did not get the endorsement from President Caid Essebsi. Islamist party, Ennahdha, which is part of governing coalition, also distanced itself from the bill arguing that such a law could hurt Tunisia’s relations with western nations and international organizations, The NewArab portal reports. Ennahdha has given up on its Islamist agenda. The North African country like most Arab countries has not established diplomatic ties with Israel. Written by: Peter Mulvany on February 14, 2018. Posted by Peter Mulvany on Feb 14 2018. Filed under Headlines, World News. You can follow any responses to this entry through the RSS 2.0. Both comments and pings are currently closed.